When it comes to things like egg salad or tuna salad I’m usually the first one to say “ew”. I really dislike pickles and relish anything that looks and smells like them, so unless I know 100% that the salad that’s in front of me doesn’t contain those gag-inducing items, I’m not eating it. 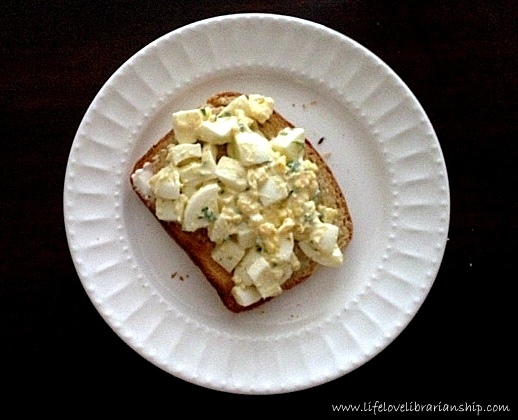 Which is why this egg salad is so great. It doesn’t have pickles or relish in it. It relies on fresh herbs for flavor. I like to eat egg salad on crackers for lunch, but this also makes a really good sandwich with some lightly toasted bread spread with a little mayo and lettuce. Place eggs in a saucepan and fill the pan with enough water to cover the eggs by an inch or so. Bring the pot to a boil over high heat, then reduce the heat to medium-low and simmer the eggs for 10 minutes. Drain the eggs and put them in a bowl filled with cold water and ice cubes. Allow the eggs to cool for 5 to 10 minutes and then peel them. Chop or dice the eggs to your liking and place them in a bowl with the mayo, mustard, herbs, and salt and pepper. Mix to combine; taste and adjust seasonings accordingly. Serve with crackers or on a sandwich. The salad will keep in an airtight container in the refrigerator for up to 3 days. *If you’re watching your diet, you can use 4 whole hard-boiled eggs, and 2 egg whites. If not, just use 5 whole eggs.